This 1-day training course took place at the offices of the Federal Office for Radiation Protection (Bundesamt für Strahlenschutz BfS) in Berlin, during the 7-8 November 2018. This was an intermediate level training course which focused mainly on the Nucleonica core applications with emphasis on Case Studies. A detailed description of nuclear data with particular reference to the various Nucleonica nuclear databases was given. Core applications were demonstrated through the use of Nucleonica applications such as the Radiological Converter, Nuclide Mixtures, Decay Engine++, and WESPA++. The new eLearning centre in Nucleonica was described. 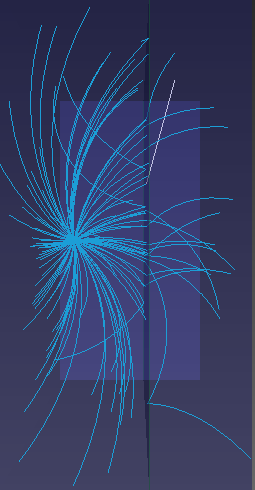 Simulation of the Stopping of 500 keV beta particles in 1 mm tissue using Nucleonica’s Virtual Cloud Chamber. A major focus of the course was on nuclear security related exercies on the identification of suspected nuclear and radioactive materials using Cambio and WESPA++. In total, 10 persons took part in the course from the various BfS locations in Germany.